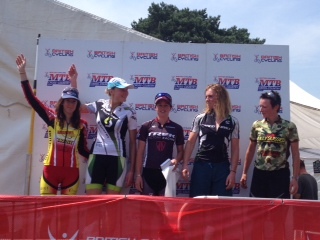 An eventful (and hot) British MTB round at Margam Park in Wales. A proper mountain bike course here with some brutally steep ups and similarly steep downs with some difficult drops and rocky shutes to give this venue its rightful reputation as a “right proper mountain bike course”. A field of around 35 riders comprising of all the usual domestic names plus Trek Factory Racing rider and World Cup winner Rebbeca Henderson from Austrailia made for a fine fight today. Nikki Harris (Scott Contessa and reigning British Champ) piled the pressure on from the start and got a gap together with Henderson. I sat 20 seconds back after the first lap in 3rd with another gap then a fight behind me for 4th and 5th. These gaps grew bigger by 15 seconds a lap until Nikki took a fall in the 3rd lap allowing me to overtake for 2nd place. Then, on my penultimate lap, my rear brake calliper sheared and I was left to run the last descent into the tech zone where my able assistant (thank you Ferga x) helped me take the calliper off and cable tie it to my frame. Overtaken in the tech zone by Mel Alexander i had my work cut out for me and with only one brake on a technical course i wasnt sure if i d be able to claw it back. Thing is with only one brake there is only one speed you can descend. I thought I was going fast before but apparently not as fast as gravity allows. My final lap was my fastest and most terrifying of the 6 lap race but the result was worth it. I finished some 4 minutes down on Bec which is still well within the commonwealth qualification criteria (double tick) and put myself back in the running to win the British Series. I must let Andy Murray know how I got on today. He’ll be sitting at home waiting to celebrate.